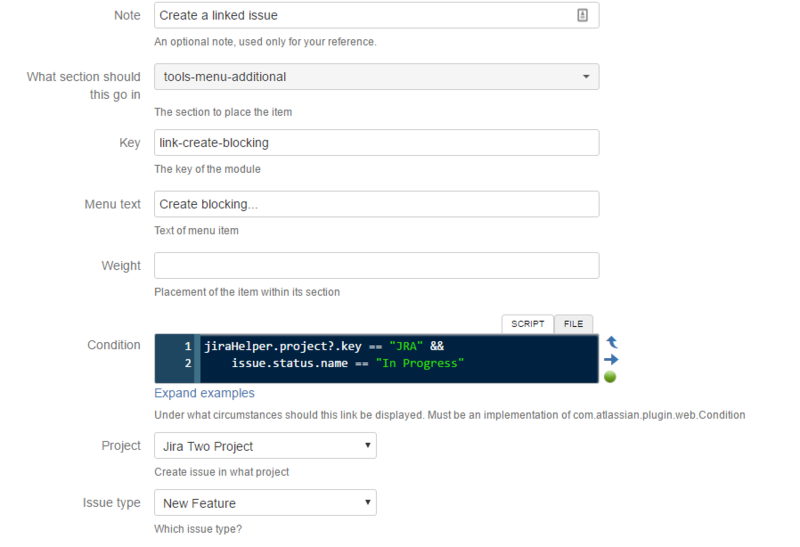 A special case of a web item creates a menu item that will open the Create Issue dialog with a predefined project, and optionally issue type. This can be useful to workflow designers. Imagine a workflow where at one transition the user is required to create a new linked issue. Typically this is done by having a self or any to any transition which will created the linked issue with a post-function. Then the user is required to edit the linked issue further. This built-in script removes this action from the workflow, and allows the linked issue to be edited in the create step. Note the condition, which says that the link will be displayed only for one project, and a particular status. We are placing the item in a new web section which we created in opsbar-operations. The problem here is that the issue won’t be linked automatically. The solution is integration with Behaviours. A Behaviour is required to pre-fill the Linked Issues field. We don’t want this behaviour to fire on every issue that it’s mapped to though. A behaviour script is able to get some information about how the create issue dialog was opened, which is the ID of the web item. Gets the ID of the web item that was clicked, in the example above it would be link-create-blocking. Gets the ID of the issue that was on the screen when the item was clicked. With these we can create a behaviour, with the following initialiser function. The behaviour must be mapped to the target project, but because you are checking the context ID, it won’t be fired when an issue is created in this project from the normal Create button. You may wish to create a subtask of the current issue (or any other issue) at a particular stage. 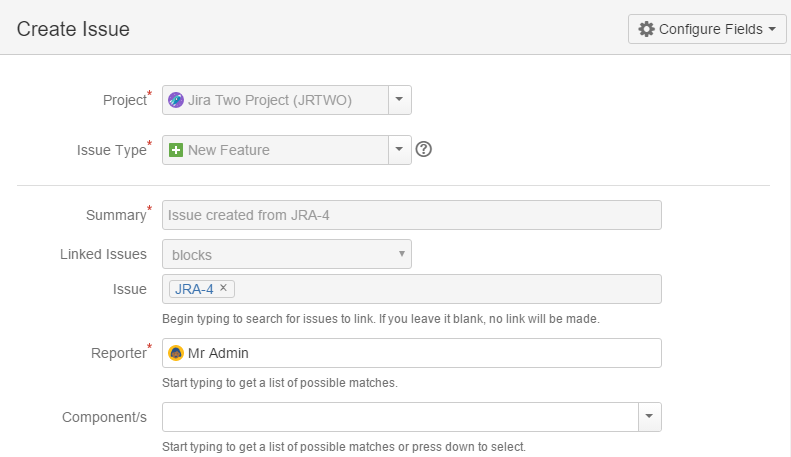 We currently don’t have support via the UI for this (SRJIRA-2162). But you can do it with a raw XML fragment, with the caveat that the form will open in full-screen mode. Reminder, pressing the Preview button generates the XML for any web fragment, which you can modify and submit via the raw xml module built-in script. 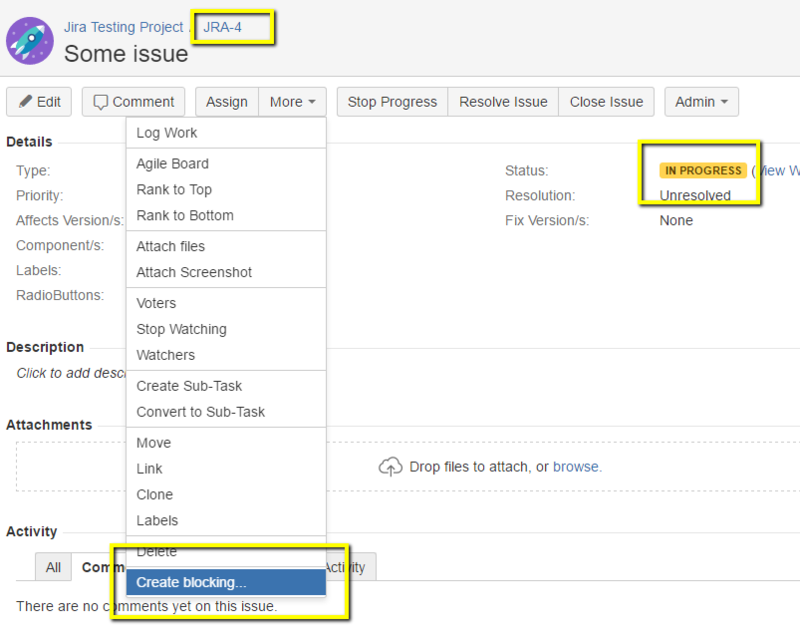 Set the issue type ID of the subtask, and set the context path correctly. In the case of the example above it is /jira.